As it happens, I was taking a service at our local church today. Today being the last Sunday before Advent, known as Christ the King but also known, for longer, as Stir-Up Sunday (after the collect for the day which begins ‘Stir-Up, O Lord’) It also became the traditional day to Stir-Up the Christmas Pudding or, for some, the cake. Taking a service?? No, I’ve not become a vicar overnight – but I have been a Worship Leader for almost a year – well – eleven months – ish. Anyway – back to the story … my idea was to get the congregation to bring up the ingredients and stir each one in – and to (here’s the difference to hundreds of other stir-up sundays) COOK the pudding to be eaten at the end of the service. Those of you who have followed my blog for a long time know that I end up sharing my recipes with you – some of these are really popular – especially the microwave jam. 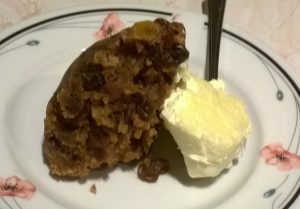 You already have the Christmas – very rich fruit cake adaptable to any size or shape tin – cake) here so today, after the response from those who ate the Christmas Pudding after the service – I’m going to share my recipe for a Microwave Christmas Pudding. This is so quick to cook I have been known to stir-it-up on Christmas morning – though I prefer to make it the day before and just heat it up on Christmas day – as it takes longer to weigh the ingredients than it does to cook it! It is a light and fruity pudding – which is how we like it. This recipe is adapted from one I found in a microwave cooking magazine many, many years ago (probably about 3o years ago!) but I have changed it so much to suit our family tastes it isn’t the same recipe any more – so I will call it ‘mine’. Note: Step 1 needs to be done the day before. 24g Dried Apricots (chopped finely) if you like mixed peel you could add this instead – I don’t. 1 – 2 tablespoons Milk – as required. I am assuming you will make your breadcrumbs – it’s easy enough, just make sure the loaf is not too fresh, remove crusts, cut into chunks and whizz in a food-processor. Step 2 In a bowl mix all the ingredients in the list down to the butter. Step 3 Add the butter – and rub in, until the mixture all looks like breadcrumbs again and the butter is evenly distributed. Step 4 Add the soaked fruit, the chopped apples and apricots, the honey and the lemon. Stir in well together. Step 5 Add the egg, mix really well – stirring until the egg completely coats everything. Step 6 The mixture needs to be soft, so that the ingredients blend together. This is so hard to describe – but the gradual addition of a little milk, well mixed in, should see the texture change from a rough, lumpy texture to a smoother texture – but not wet! Place in Microwave. A 900-1000 w MW will only need 6 mins – and 6 mins standing time. therefore a 700-800 w MW will need about 7 mins – and 6 mins standing time. The standing time is important as the centre of the top will go from looking a little sticky to dry and cooked looking in this time. Loosen with a pliable spatula, place a plate on the top, invert, and the pudding should come out nicely. ENJOY – with Cornish Clotted Cream – of course!! How do you like your Christmas pudding?